I didn’t get around to finishing any products last month, and wasn’t sure if it would happen this month either, but I actually managed to get 3. Olay Fresh Effects Shine, Shine Go Away! shine minimizing cleanser – This contains kaolin clay, which is what produces the “shine minimizing” effect after use. I can say it did work pretty well, and I loved how it foamed up when I used it along with my Clarisonic. Unfortunately it’s been discontinued. TRESemme Split Remedy leave-in split end conditioning treatment – I probably owe much of my hair’s manageability to this product. It smells great, isn’t greasy, and pretty much did its job of keeping my ends from drying out. I’m sad to see that this too has been discontinued, and am currently trying out similar product from another brand. Hopefully it works just as well, if not better. L’oreal EverSleek Reparative Smoothing Shampoo – I’m totally digging his brand’s line of sulfate-free shampoos. I currently use this and their formula for colored hair. Haven’t had any issues with frizz since. I will definitely buy it again. Located in San Francisco’s Japantown off of Post Street, this has been a frequent stop for me and my friends when satisfying our afternoon tea craving. Their Tea for One includes finger sandwiches, warm savories, a scone and crumpet, desserts, and a pot of tea of your choosing. I either get their Strawberry Oolong or Murky Water (it’s actually a fruit blend tea, and really good). For $28, that’s the best deal I’ve seen by far up here. Once located in downtown San Jose, they have since moved to their new one in Saratoga. I loved the inside ambience, not to mention their extensive selection of teas. Customers are able to look at and smell the different types before placing their order. The English Afternoon Tea ($37) or Tea for Two ($63 or $31.50/person) would be my recommendations if you’re willing to go all out. I would prefer the former because it includes a crumpet. I really don’t eat those anywhere outside of afternoon tea! Call me biased if you will, but I absolutely adore this place in San Diego even though it’s the only SoCal location I’ve visited. I’ll heighten that sentiment even more because I celebrated my birthday here with some good friends. Their Queen’s Tea is $29/person, offering seasonal menus of various finger sandwiches, sweet and savory pastries, dessert, and unlimited pots of tea. They even gave me a candle lit mini cupcake and sang since it was my birthday. Talk about awesome service! I highly suggest making reservations, especially if there’s a large group. Some locations will take walk-ins depending on availability, and they may also have gluten-free options upon request. It’s always best to plan ahead, and bring an empty stomach because some of these menus can be surprisingly filling. Have you ever had afternoon tea before? Feel free to let me know if you have any recommendations. Wherever you are and whomever you’re with today, wishing you a blessed day with lots of great food and wonderful memories with loved ones. Props to you if you’re doing your going Black Friday shopping online tonight as well. I sure am! Also, here’s a song that I always listen to this time of year. My first post on World of Geek Stuff is finally up! Click the image below to check out my review of the Japan Crate Mini Crate subscription. Almost about to hit 1 year with my Studio Calico subscription! Debating on whether or not to stick with their Project Life (now called Documenter) kits or switch over to something else. November’s kit is entitled Canyonlands. My pages for last month and September were kept simple. Work has been keeping me busy and exhausted, which explains the lack of posts for the past month or so. I’ll be working on a few more to schedule later this week. Found this one on stashmatters‘ blog. Blush or Bronzer? Easy, blush. Still getting the hang of using bronzer. Lipgloss or lipstick? If you’ve been following my blog for a while, you know how much I love gloss. Eyeliner or mascara? 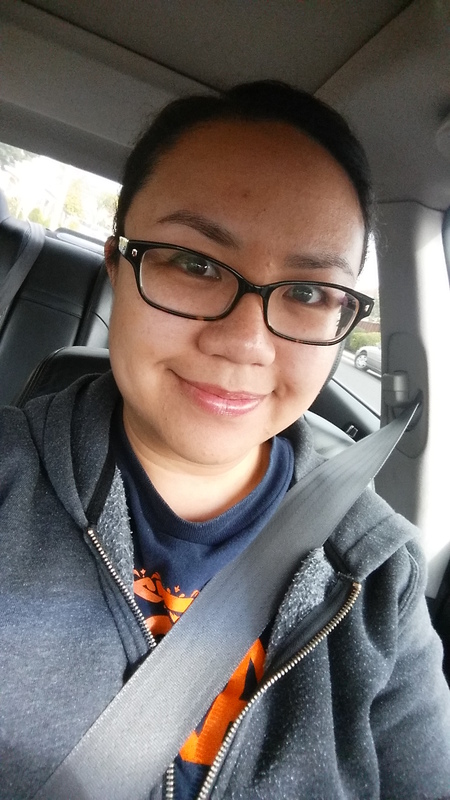 Didn’t reach for it much when I started using makeup, but mascara is way easier for me to apply than liner. Foundation or concealer? Lately I’ve been more concerned about letting my skin “breathe” since I’m treating my face for mild acne. Concealer does the job well with covering up just the problem areas. Neutral or colored eye shadow? If there were a group called Neutral Lovers Anonymous, I’d totally join. Pressed or loose eye shadow? Pressed pwns loose. Brushes or sponges? I use brushes more often, however, sponges come in handy for blending foundation and concealer. O.P.I. or China Glaze? Tough one here. I own colors from both brands, but CG gets extra points for price. Brights or darks? Wait, what? No neutrals? Hmmph. Dark side it is. Flower or no flower? Nope on designs. Just nope. Perfume or Body Splash? I actually use both. Body splash daily, and perfume for special occasions. Lotion or body butter? I use lotion more. Not enough, but much more than body butter. Body wash or soap? Both. LUSH or other bath company? I’ve tried a few things from LUSH, but not their bath products. I don’t really lean towards a particular company when it comes to them. Jeans or sweat pants? Jeans for going out (obviously). I live in sweats when I’m at home. Long sleeve or short? Been using the long sleeves lately because of work. But I tend to warm up quickly regardless of the season, so short ones FTW. Dresses or skirts? How un-girly of me to say this, but I’m not a big fan of either. Stripes or plaid? Mad for plaid! I have a handful of short sleeved button ups from H&M. Flip flops or sandals? Flip flops. Scarves or hats? Scarves. Sometimes I wish I could get more into hats, but I feel they don’t look right on me. Studs or dangly earrings? I wear studs every day. Necklaces or bracelets? I’m more for the arm candy. Heels or flats? Flats. I just can’t seem to hang in heels as long as I used to. Cowboy boots or riding boots? Riding boots. I should look for some since it’s been a while since I’ve bought a pair, generally speaking. Forever 21 or Charlotte Russe? Eh, no. H&M, yes. Abercrombie or Hollister? I haven’t set foot inside either of them in years. Not like their stuff fit me well anyway. I was more of an Aeropostale shopper. Saks 5th or Nordstrom? There’s more of the latter around my area. Curly or straight? It’s a toss up between straight and wavy, depending on my mood. Hairspray or gel? I use both depending on the hair issue. Side swept bangs or full bangs? Side swept. Up or down? It’s usually up. Fall or spring? I like aspects of both. Chocolate or vanilla? Chocolate. Dark. East coast or west coast? Wessyde!!! Last month’s bag theme focused on being able to “transform into whoever you want to be”, and being able to use beauty as a means of personal expression. Emite Make Up Professional Slant Tweezer – I aready have a go-to pair of tweezers, but this can easily be tossed into my toiletry bag during travel. Eva NYC Therapy Session Hair Mask – I have yet to use a hair mask, but I figure this would be similar to a deep conditioner. No plans on using it any time soon. LeeAnni Eco Go Away Gloomy Day Serum – As adorable as the product name is, I don’t see myself using this right away either. I’m currently trying to clear my face from a past acne breakout, so I don’t want to introduce anything new to it just yet. tarte deluxe LipSurgence skintuitive lip gloss in energy – My favorite product from this bag. I’m not the biggest fan of pink colored anything, but I liked the shade that this gloss had. It applies clear, then produces a custom pink shade according to your skin’s pH. Science, y’all! Wearing the tarte gloss by itself. The pink shade is very subtle, which I like. theBalm Cosmetics Mary-Lou Manizer – I’ve got more than enough highlighters for the time being thanks to ipsy. This isn’t too shimmery and adds just the right amount of glow. 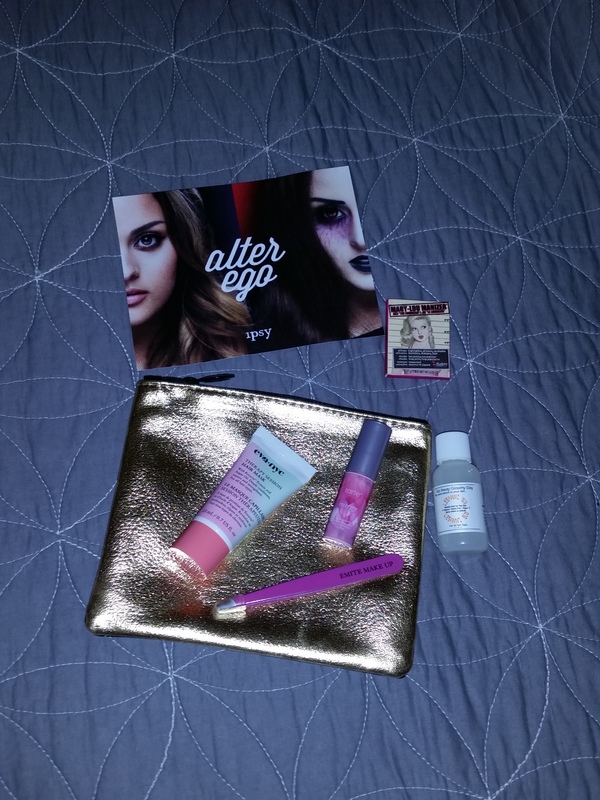 With the exception of the 2 products I have yet to try, this was another nice Glam Bag.